A fishing vest – that’s what a fly anglers needs! If someone thinks that this is an analogue of the common vest, which is uncomfortable in use then there is a huge mistake. 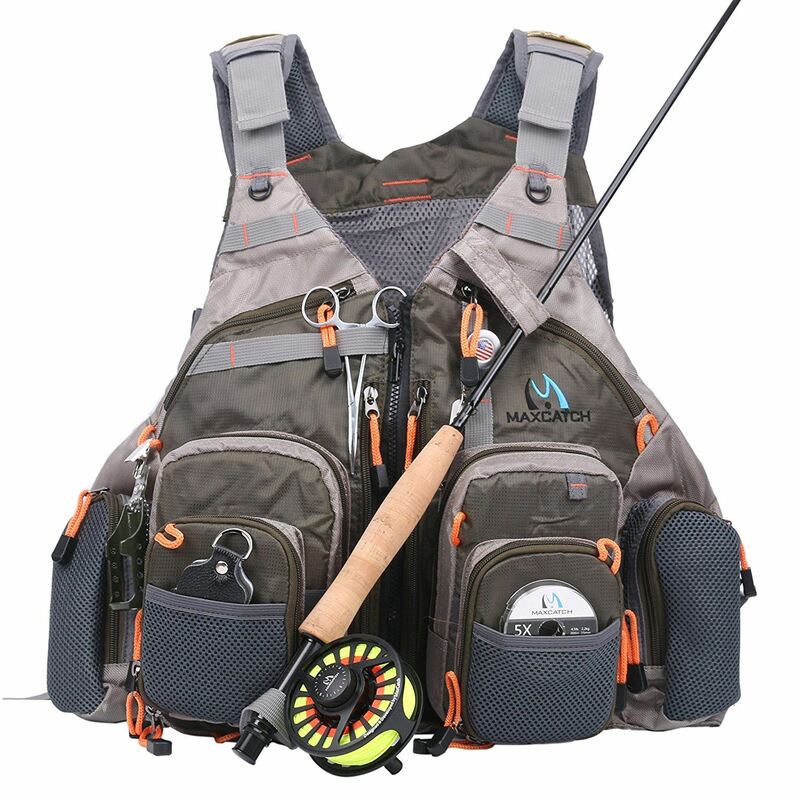 Modern fly fishing vests, in the development of which took part fishing anglers with a world-wide name, are extremely useful, and therefore provide maximum functionality in any conditions and can completely replace a backpack, leaving your hands free. So what else is needed? Looking at the fishing vests that are represented on market it’s quite difficult to make up mind even for experienced anglers. There are cheap and expensive, Chinese made and branded, with many pockets, with plastic boxes, with a large pocket-net and even winter warmed models. Which fisherman’s vest from them to choose and which model to give preference to? Here are the best options you may like. This vest is made for fishing and other outdoor activities, that has a multiple sturdy zip compartment, which offers multiple function. The vest is quite effective, as it is capable of being loaded up for long distances out to the stream. The fabric is water resistant and lined with mesh for breathability. The vest can be adjusted for an appropriate fit. The vest has 2 shell pockets with fly patches that increase the storage. There is a rod holder strap, which can hold the rod tube. Comfortable mesh back of the vest reduces the weight and dissipates heat. Plenty of pockets are great for storing a lot of gear and keeping it protected and organized. The vest itself is not too durable. Wearing this vest you can afford only a season or two but not more. Here is a mix of of backpack and vest. AnglaTech Company is recognized for its fly fishing accessories. 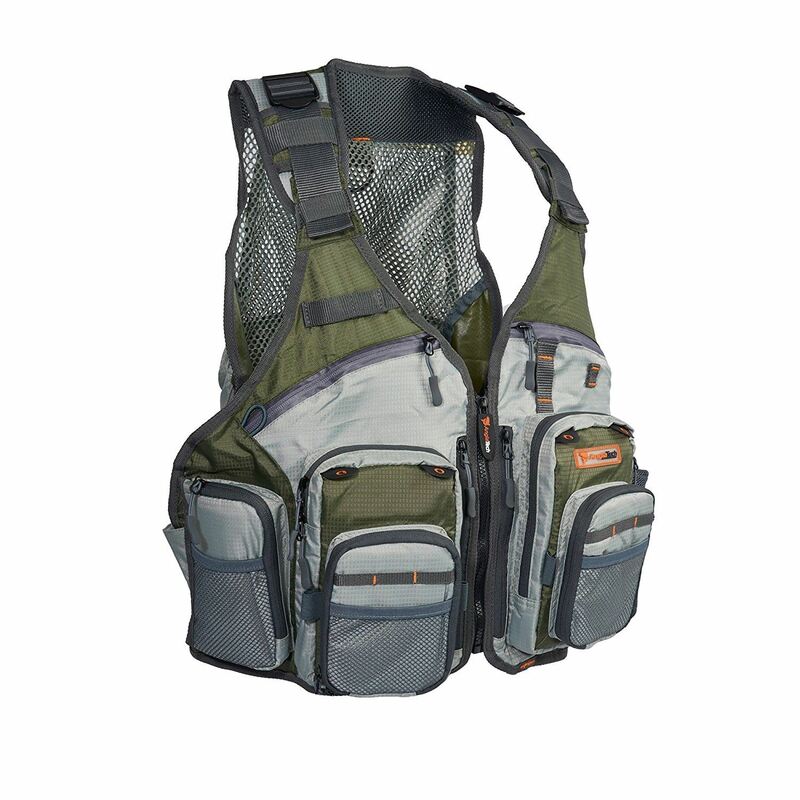 This model is a versatile item with a fishing vest on the front for extra storage. It provides anglers great possibilities when it comes to storing all essential accessories in water. It is one of the lightest vests on the market. The mesh back of the vest for fly fishing is also a great feature. It allows air to circulate across the back, keeping it cool. The cord pulls on the zippers of this vest are another great feature. They reduce the noise of opening and closing the zippers, and also allow you to reach them more easily. The straps allow the vest to fit everyone really well. 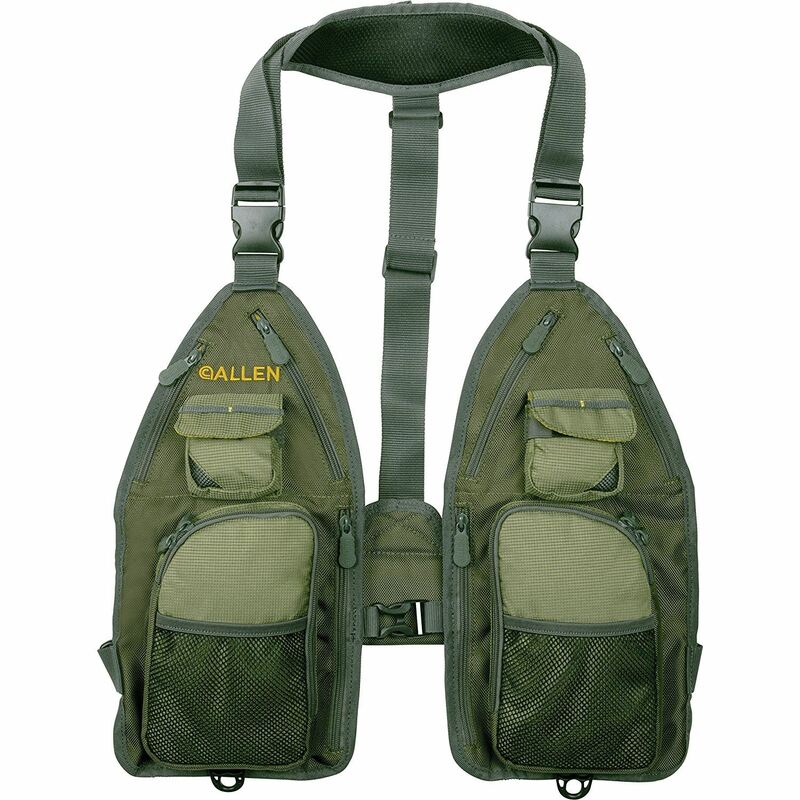 If you aren’t looking for a durable vest, then this vest from Allen should please any angler. It’s a vest with simple design. You can keep the necessary gears for a short trip. Allen manufacturer offers a great storage capacity to the anglers. You can keep large fly boxes on the zip closure front pockets. The neck strap is padded and comes with a D-Ring to attach. It also has large interior mesh pocket and multiple exterior pockets. The Gallatin Ultra Light Strap Pack is lightweight and offers maximum storage capacity. With a padded neck strap and net D-ring should fit. The vest features zip close front pockets that hold large fly boxes, a large interior stretch mesh pocket for boxes or gear, high-viz lining, plus multiple exterior storage pockets. All zippers are heavy-duty molded. Only one size of the vest may not fit most anglers. This extremely light fly fishing vest allows keeping everything you need. There are a few pockets and compartments, as well as several places to clip on to. There is a large pocket in the back and inside of the fly fishing vest. The vest also has the feature to hold the fly rod hands free. This fly vest is adjustable at the shoulder and waist to fit the size. The front zips together or optionally buckles together. The fishing vest mesh back allows air to flow through the fabric, to keep you cool and dry when it’s hot. The fly vest evenly distributes weight across your chest and shoulders and allows angler to fully move the arms. The quality of the zippers should be better. One size may not fit most anglers. High quality and lightweight materials of this vest make it perfect for long trips because it doesn’t weigh down. 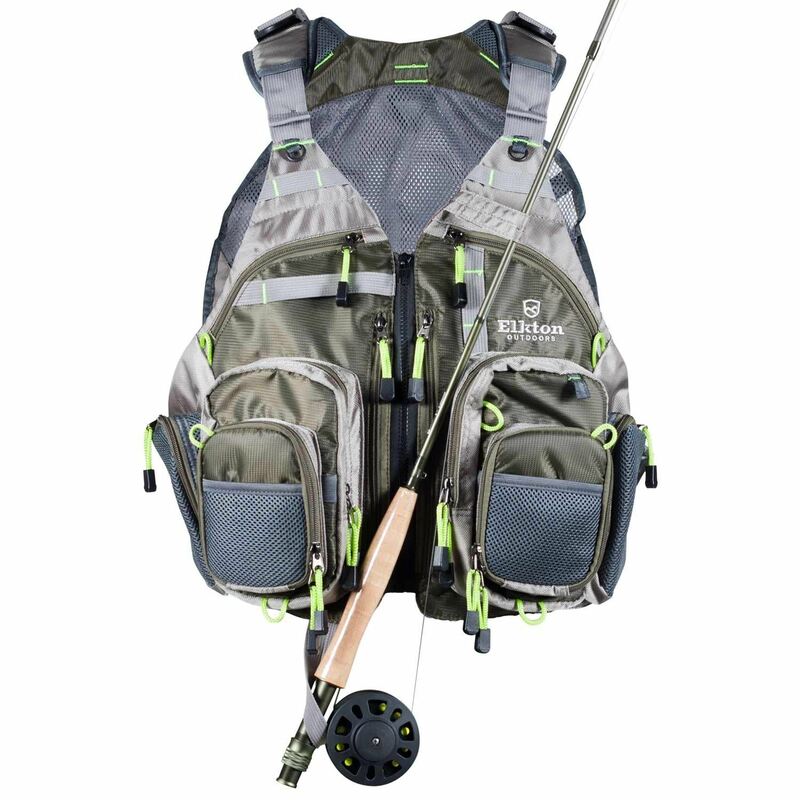 The vest from Elkton is great for all types as it combines fishing vest and fishing backpack to be functional. It is equipped with all the storage including: 2 hard shell fly compartments, 8 general storage pockets and a 3 section extendable rear backpack. This vest allows you to have necessities thanks to 2 retractable swivel tethers and a built in rod holder. Lightweight water resistant nylon paired with breathable mesh allow to store fishing gear. There are soft, padded material and multiple points for adjustment. The rod holder frees up the hands. Two built in swivel retractors keep tools secure that you won’t drop. 3 D-rings in the back make it easy to place the fishing net. Two hard shell fly storage pockets allow quick access. The straps tend to slip down. 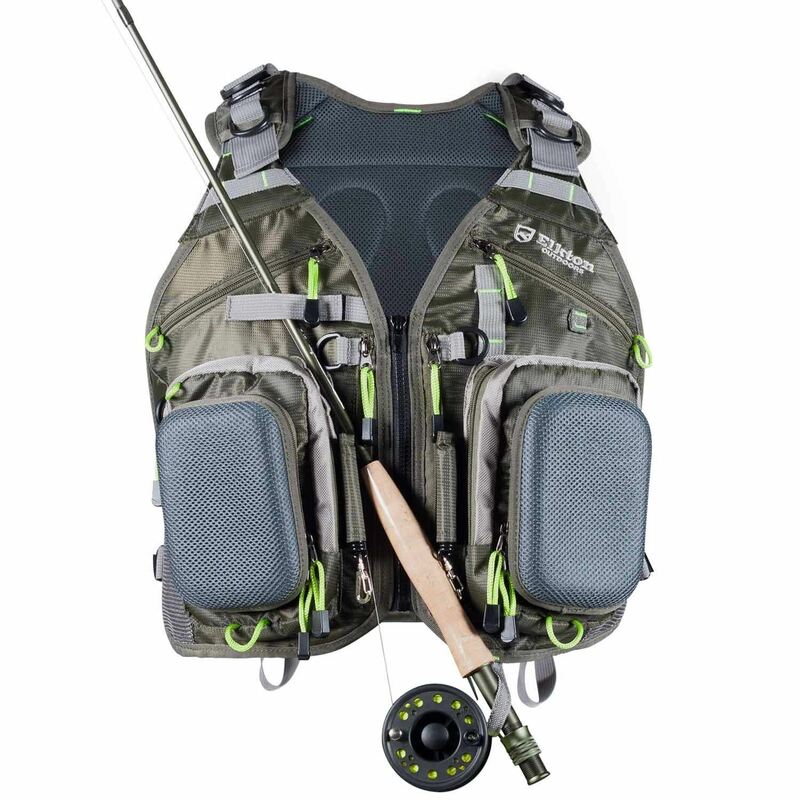 The Anglatech Fly Fishing Tackle Backpack Vest Combo is a great choice instead of traditional fishing bag. At the front is a vest with a zip closure and a few zippered pouches. The zippers have cord pulls. The vest does not restrict movements, and its mesh keeps you cool. On the back is a heavy-duty backpack with 3 compartments on a zipper, slip pockets and D-rings. The bag and vest are adjustable at the shoulders and waist thanks to buckles. Breathable mesh at the back allows the air to flow through so that angler stays cool and dry. Adjustable shoulder and waist straps provide great fit for men and women. The vest includes 1.5 Liter water bladder to keep body hydrated during fishing. The stitching of the strap at the back to the front is not of a good quality. This fishing jacket looks is an outdoor vest with 11 zippered pockets and multi attachment ladders and accessory loops on the front and wide reflectors on the back, and shoulder. It is made with premium rips top polyester shell and replaceable EPE foam inside for superior buoyancy. There are four chest pocket, four zipped front pockets, two side mesh pocket, and one generous back pocket in total. Mesh on the back and mesh fabric inside deliver high breathability. Multi webbed adjustable buckle straps offer a custom fit for almost any person. If an angler is average in size then it also can run small. This vest is not PFD. 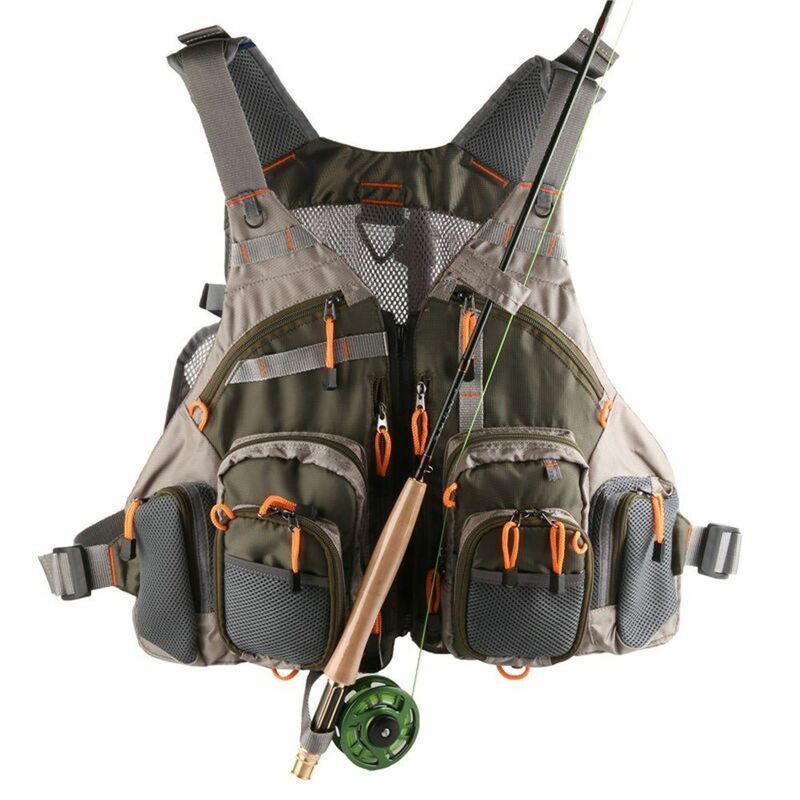 Elkton Outdoors Fly Fishing Vest provides fishermen the best fishing experience. The vest made of high quality, lightweight materials that are great for long fishing trips as it doesn’t weigh you down. Soft and breathable mesh keeps cool and dry on hot days. This vest is made with padding and adjustable straps. The durable, rip-stop fabric on the fishing vest pack will serve you not one season. This fly fishing backpack is equipped with 2 hard shell fly compartments, 8 general storage pockets and a 3 section extendable rear backpack. Lightweight water resistant nylon paired with breathable mesh makes feel comfortable and easy to use. Thanks to soft, padded material, and multiple points for adjustment, this fly fishing vest fits great. Straps at the lower part of the vest cannot be adjusted appropriately. 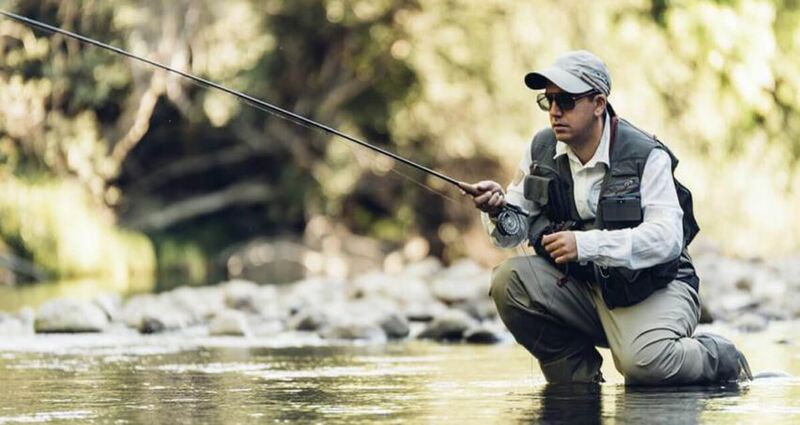 The Autumn Ridge Traders is specialist in the making outdoor gear like fly fishing vest. The vest comes in different sizes to make sure the size perfectly fits you. The vest fits comfortably allowing easy movement when fishing. The vest is well balanced with a breathable mesh to keep you cool. The khaki fabric is water resistant protecting all you have in the pockets. It also dries quickly when gets wet. 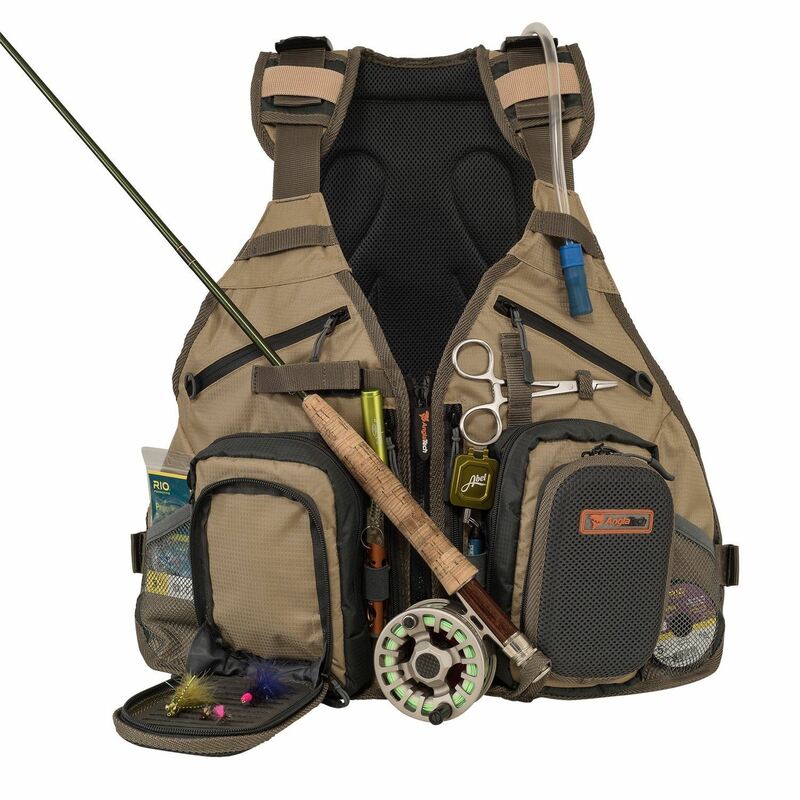 The vest comes with 16 pockets that allow to store all the accessories needed when fishing. The style is also great and functional with an outer shell that folds into a pocket for better airflow. The size may run small than what you regularly wear. 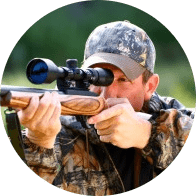 The need for a vest is difficult to overestimate: after all, it can accommodate many small items that are stored in a backpack before fishing, but when fishing they should be at hand. 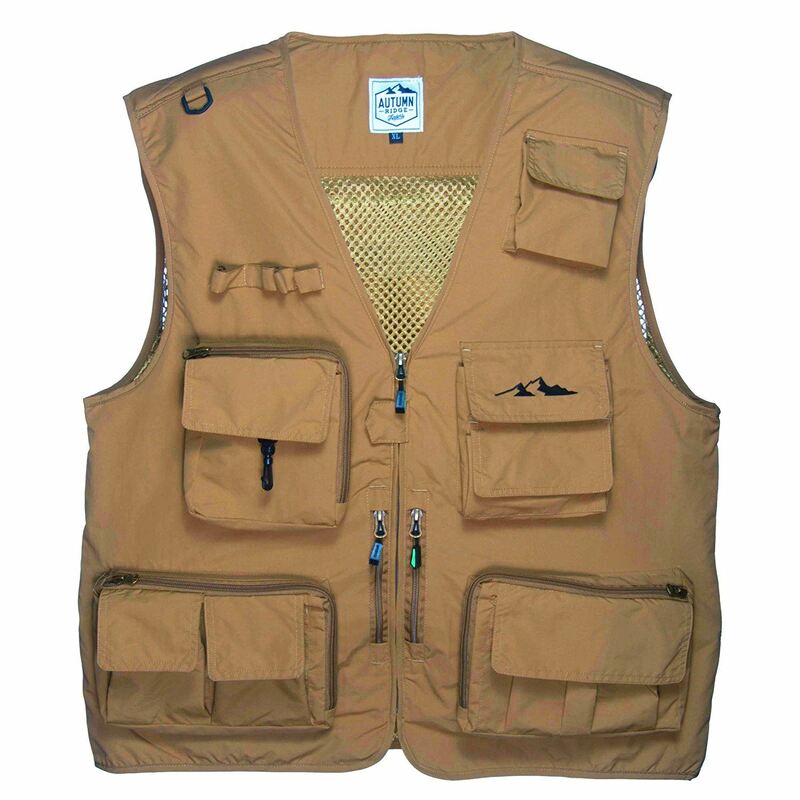 A vest is the most important part of the outfit not only of the fly-fisher, but other anglers. It is easily packed into any bag to be dressed already in the place of fishing. In the vest you can place some tackles and a couple of sandwiches, and there is even a place for a thermos with tea. And for all this, it will not be necessary to go somewhere during the fishing: everything that is needed is near, and the hands are completely unloaded. That’s why these vests are often called unloading. With their help, everything you need can be evenly distributed to storage locations – in special compartments in the form of pockets. It is very worthwhile to pay attention to the quality of sewing. All seams should be strong enough and doubled. Buckles, belts and zippers must withstand heavy loads, bumps and jerks. When purchasing a fly fishing vest, you should consider the time of the year the vest will be used. The difference between the “winter” and “summer” option is the material from which it is made. For a cold season, you should look at vest made of materials such as “duplex”, “oxford”, “membrane”. All of them have good heat-shielding, wind-resistant properties. For hot weather, vests made of “rip-stop” and “twill”, which are less dense in their structure, are breathable. However, “summer” and “winter” vests made of materials consisting of cotton and synthetic impurities can be a great option. This is due to the fact that synthetic fibers are less susceptible to wear resistance, which significantly extends the life of such items. A large number of pockets and their proper location – that’s what distinguish a high-quality vest for the fisherman from the cheap one. It must certainly have several large pockets designed for storage of boxes with spinning lures of standard size, as well as several small pockets for storing fishing trivia with a quick access to them. Outdoors, there will be waterproof pockets, both external and internal: a modern angler takes with him on fishing a large amount of electronic equipment, which cannot be exposed to moisture. We don’t recommend taking vest with too many pockets for newcomers as only professional anglers may require more space for fishing gear as they’re experienced. Skillful fishermen used to take a few boxes on fishing and some prefer quick access to the flies. In this case bench style pockets are a great option for fisherman. If you are going to walk long distances and spend a few days on fishing then you may need a vest with not several pockets but a built-in backpack so it’s easy to storage personal items at one place. If you often spend only a few hours on the river then you may not need more than a chest vest. The correct fly fishing vest for fishing must certainly have a large number of adjustments – at the waist, and near the breast. Each angler is individual, and the model that fits one angler, the other can be very discomforting. Since anglers spend a lot of time on fishing it is better prefer a vest with a system to reduce the weight on the neck and shoulders. There are many models that spread the weight of the vest around the upper body, avoiding stress of the rest of the body. The quality of the fabric and the quality of the seams, especially on the pockets. It is these areas that are most stressed. Quality of lightning and valves on pockets. Lightning should work without jamming. Velcro fasteners of the pockets can be considered the most convenient, since zapping lightning is excluded. The dimensions of the pockets must correspond to the dimensions of the boxes for the nozzles. Here, either buy boxes under the vest or pick up a vest under the boxes. It is desirable that one of the pockets (most often internal) has maximum protection against moisture. This pocket is used for storing a mobile phone. The standard vest protects the chest and upper body and comes with variety of pockets. Chest vest is not that big like standard and includes not too many pockets. 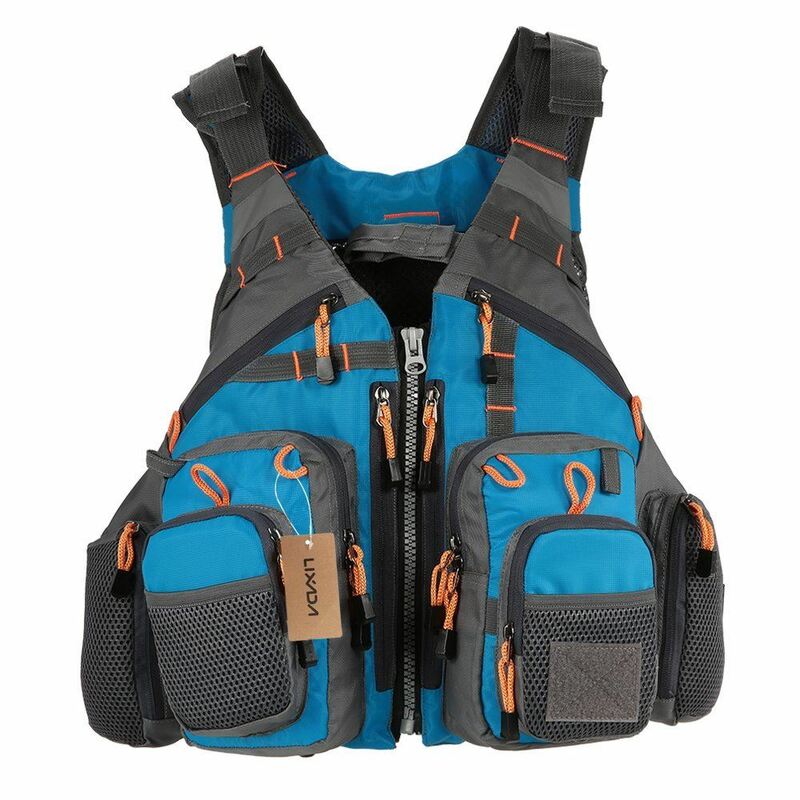 In case it’s fishing deep in the water then it is better to choose chest vest as standard vest can get wet and weigh down, and to move will be quite difficult. However, if you need to have enough space to take all the gear, then a standard vest is a great option. There is not guarantee that purchasing a vest by famous brand you have a high-quality item but there are some brands that proved its effectiveness, which you can trust and count on. Prestige. The owners are fishers themselves and that is producing fishing gear is important according to anglers requirements and needs. Prestige Company shares their tips on fishing and other interesting things. Maxcatch. This brand produces items for a reasonable price. They provide with all the fishing gear and accessories. Redington. This manufacturer makes products to meet the requirements of anglers, both newcomers and skillful one so everyone can enjoy fishing in the same way. Frogg Toggs. They are an expert in outdoor gear. Producing items, they do not forget to improve them according to client’s notes and wishes. A fishing vest is a piece of clothing that makes the fishing process more comfortable. It is not just comfortable clothes, but a functional container in which various fishing accessories can be stored. Vests for low temperatures contain a large number of pockets in which you can store everything you need for comfortable fishing. Warmed vests are designed to catch fish in cool or rainy weather. Such models perfectly retain heat, but, at the same time, they do not hinder the fisherman’s movements. Warm vests can be worn under the outer clothing or above, which is even more convenient. Fly fishing vests are presented in a huge variety today, but only in pursuit of cheap model you can lose quality.